Today, almost all communications require access to the Internet to function. Because of this, increased scrutiny and preparations are being made by agencies across the country to protect against cyber terrorism and/or other disasters that could cripple the Internet. Over the years we have seen terrestrial failures knock the ability to communicate offline, hindering relief efforts and scrambling response. To ensure reliable “off-grid” communications, IP Access International introduced our community to the RedPHONE. The RedPHONE is a voice service that operates between satellite nodes and is routed over the IP Access SELECT Network. Due to their terrestrial independence, over 1,700 RedPHONES have been deployed in over 600 agencies across the country, providing protection and operation when everything else is offline. Once part of the community, users will have access to a web-based online directory, showing the status and extension of other RedPHONE subscribers. Already a member of the RedPHONE community? Get more from your IP Access International RedPHONE with the roll out of RedPHONE Enhanced and RedPHONE Enhanced DID. Both options come standard with all of the features of the original RedPHONE, but allow you to add outside calling and direct dialing. 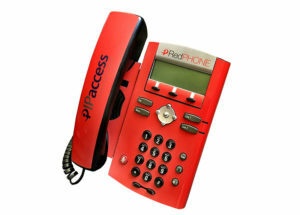 Contact your IP Access International Sales Representative to find out how you can upgrade your existing RedPHONE.